So, aspirants who have applied for the NIMHANS Recruitment 2018-2019 can successfully download the NIMHANS Staff Nurse Hall Ticket 2018-2019 through this article. The National Institute of Mental Health and Neuro Sciences are going to release the Hall Ticket on 22nd May 2018. Also, we are providing you with the direct links that redirect you to the official website. And, from there you can download Hall Ticket in the form of PDF. Moreover, the higher officials are conducting the exam on 3rd June 2018. So, aspirants who are willing to attend the written test can download this admit card. Also, check Download nimhans.ac.in Admit Card 2018 links in the upcoming sections. Refer to the NIMHANS Exam Pattern 2018 and NIMHANS Selection Process 2018 through this article. 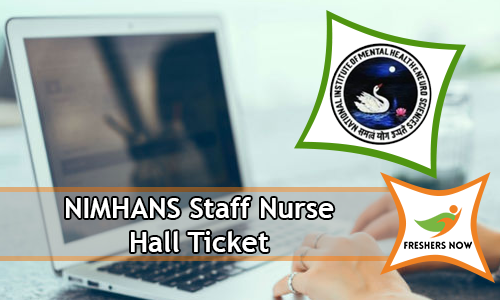 Are you looking forward to downloading NIMHANS Staff Nurse Hall Ticket 2018-2019? Then you are at the right place. Aspirants those who have successfully registered for the NIMHANS Recruitment 2018-2019 can only download the nimhans.ac.in Admit Card 2018. Also, after downloading the hall ticket candidates have to check the printed data on the admit card which is mandatory. So, contenders can check the details regarding the Applicant’s name, Father’s name, Mother’s name, Exam Code, Exam Center, Date of the exam, Applicant’s photograph, and signature. If anything does not match with the real one, then candidates have to approach the authorities through the official website @ nimhans.ac.in. In addition to this, also check hall ticket staff nurse, staff nurse hall tickets 2018. Therefore, regarding more queries and updates keep browsing our article. From the above table, aspirants can now take a look at the name of the organization, the number of vacancies, the name of the post. Also, date of the written exam, official website, availability of admit card etc. So, aspirants hurry up. You can download the Admit card easily through the links given below on our website. We have heard that aspirants are cheated by fake news and fake information by various other websites. To solve this problem, we decided to provide you with the active links and latest updates. So, by clicking this link, you can easily redirect to the official website. Moreover, aspirants can also visit the official website @ nimhans.ac.in for more details and queries regarding NIMHANS Staff Nurse Hall Ticket 2018-2019. The higher officials of National Institute of Mental Health and Neuro Sciences are planning to release the nimhans.ac.in Admit Card 2018-2019 on 22nd May 2018. So, aspirants can stay tuned to this website to grab the admit card on the release date. Moreover, candidates those whoever is willing to attend the NIMHANS Staff Nurse Written Test 2018 can download this admit card. Furthermore, the main thing that everyone has to remember is the candidates those who will not carry NIMHANS Staff Nurse Hall Ticket 2018-2019 will be rejected for the exam. Also, many aspirants are unable to find the exact links to download the hall ticket. Moreover, during the time of hall ticket download candidates are facing some technical issues through which they are unable to download the hall ticket. So, to avoid such kind of issues and problems we are introducing active links. These links help the aspirants to redirect to the official website quickly. Moreover, the National Institute of Mental Health and Neuro Sciences is going to release the date of the examination on 3rd June 2018. So, we kindly suggest the aspirants prepare well for the examination. You can also refer to the Syllabus, Exam Pattern, Previous Papers of NIMHANS through our website Freshersnow.com. In addition to this, candidates who are willing to attend the written test have to practice the online mock tests as the exam is in online mode. As the NIMHANS Staff Nurse Hall Ticket 2018-2019 is approaching soon, we advise the contenders to stick to this article. This helps them to download the admit card easily. Furthermore, for more queries, you can also visit the official website of NIMHANS @ nimhans.ac.in. So, in this section, aspirants can check the details about NIMHANS Staff Nurse Exam Pattern 2018-2019. The exam pattern helps the aspirants to crack the exam easily. The Written Exam is nothing but Online Recruitment Test (Computer Based Test). Th subjects include General English, Aptitude, Reasoning, General Knowledge, General Nursing, Neurological Nursing, Psychiatric Nursing, and Infection Control are the subjects for the Online Recruitment Test. The questions are given in Objective Type Multiple Choice Questions. Each subject has their marks, and each paper carries their weightage. Contender will complete their exam within the given time duration. The officers of National Institute of Mental Health and Neuro Sciences will allow the Time Limit for the Written Exam at the time of conducting the Examination. To get a job at the National Institute of Mental Health and Neuro Sciences, the higher officials will conduct the written test/computer based test as the first round. So, aspirants who qualify in the exam. And, also reach up to the cut off marks will be promoted to the next level. After completing the first round, the candidates have to attend the second round that is Skill Test. Therefore, after qualifying in both Written Test and Skill Test candidates will be shortlisted and placed in the merit list. Aspirants have to first visit the official website of National Institute of Mental Health and Neuro Sciences @ nimhans.ac.in. Next, search for the link NIMHANS Staff Nurse Hall Ticket 2018-2019. After finding out the official link, click on it. Nextly, the hall ticket will be displayed on the screen. And, check does the details printed on the hall ticket match with yours. If the details do not contact the higher officials through the mail. Download a copy of hall ticket and do not forget to carry it to the exam center. Therefore, for more updates regarding NIMHANS Staff Nurse Hall Ticket 2018-2019 and Download nimhans.ac.in Admit Card keep visiting our website.